When it comes to Houston donut shops, there are more than a few to choose from. And just as you might expect, not all Houston donut shops are created equal. And while we’d LOVE for them all to deliver exceptional value, incredible taste, convenient location, fast service, affordable prices, a welcoming atmosphere, extra value, and fresh donuts, this is rarely the case. So instead of being let down, we’ve put together the a list of things to consider to make sure you make the right choice when it comes to choosing your next Houston donut shop experience. People tend to choose the Houston donut shop that provides the best combination of ALL the following elements. With all the things in this world you don’t have a choice in, you deserve to have the exact donut your mouth is craving. Enjoying a donut should be like experiencing a tiny bit of Paradise in the midst of the chaos of everyday life. Sometimes you just have to have a certain brand of donut. If you are craving a Shipley Do-Nut, stopping by your local Dunkin’ Donuts isn’t going to do it. If you want Krispy Kreme, don’t settle for Kroger. Yes, you can get a ‘donut’, but it will feel like it is lacking something. A Coke is a Coke. A Shipley is a Shipley. A lot of people are grabbing donuts on the way to work and a long line just will not do. In fact, if you see that line stretching around the building and down the street, guess what? You’re likely to keep on driving to the next Houston donut shop, just a little bit down the road. If you don’t get that donut right now, you might explode! Okay, that isn’t what we mean by speed. You need to take into account where you are going, when you have to be there and how long it might take to get your donut. If you are in a hurry, you are likely to simply drive past any place that has a long line of people waiting to be served. Let’s face it, if you don’t mind a stale donut that tastes like cardboard, you can hit up at any old local convenience store. When you want a real donut, however, you’ll need to be more discerning. You want one that melts in your mouth and gives you that #fridayfeeling, no matter what day of the week it is. You know what kind of donut you prefer. Sometimes you just need a little color in your life, a little extra flavor, and that traditional glazed or cake donut just won’t do. You need creme-filled, jelly-filled, or maybe a hot kolache or beignet. 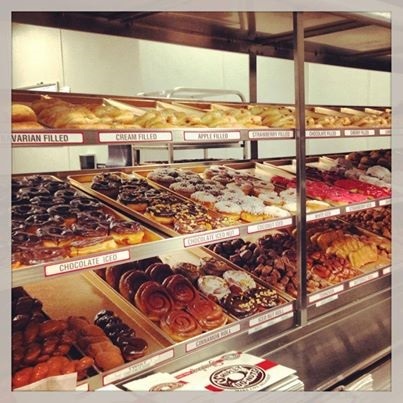 You want to pick a place that not only offers a wide selection, but that also includes the kind of donut you most want. Donuts, unlike most restaurants, are relatively priced the same. In fact, most people are hard-pressed to tell you the difference in price between their local Houston donut shops. Where price really comes into play is for catering or other large event orders, like church events, business meetings, and even weddings. This is where you need to carefully check on the price differences, which can and do vary considerably. Some days you want to grab a donut and eat it on your way to work or other activity. Other times, however, you want to take a moment in your busy day and sit and enjoy your treat. You need to seek out a place that offers seating and an atmosphere of relaxation. If you are seeking to socialize, look for a place that encourages this in its in-house seating area. If you’re looking for the freshest donuts with lots of great variety and a cafe ambiance to satisfy your Shipley Do-Nut craving, come check us out at one of our two Houston locations. And don’t forget to grab a coupon before you come for even more value.